Associate Director for Education & Outreach Suzanne Lenhart illustrates the concepts in the “Modeling with Math” teacher workshop. 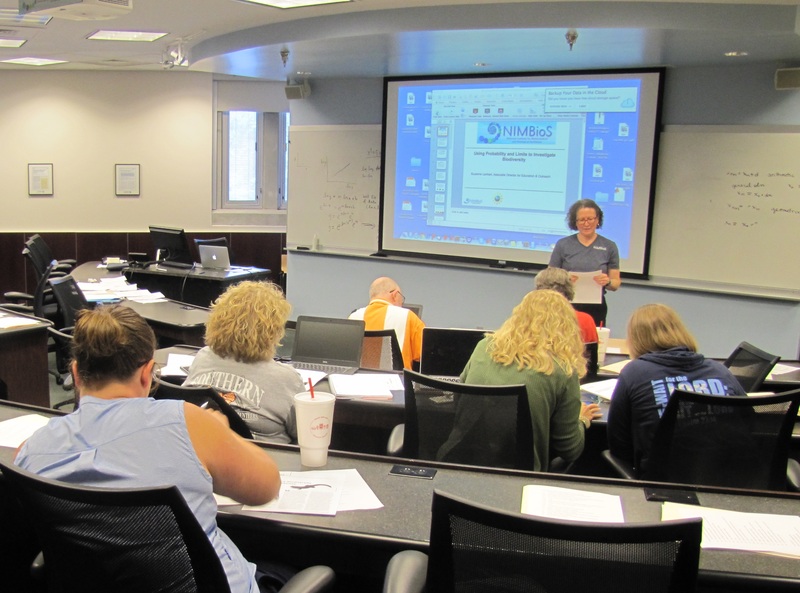 Sixteen teachers from Knoxville area high schools attended. A new resource for teachers, “Modeling with Mathematics,” with examples and exercises to illustrate modeling concepts using mathematics from Algebra I and II is now available on the NIMBioS website. Simple models with discrete time steps are included, as well as functions with continuous variables, such as time or number of dollars. Open-ended scenarios to practice creating models are also available. Additionally, two presentations demonstrate the construction of functions to fit data and the use of probability in biology models. An Excel file is provided to iterate and to illustrate discrete models with sequences. The teacher workshop for which these materials were developed was conducted in cooperation with Lynn Hodge, associate professor of mathematics education at the UT-Knoxville, and was partially supported by the East TN STEM Hub and the Center for Enhancement Education in Mathematics and Sciences. The unit is another addition to NIMBioS’ growing list of educational resources, which includes nine educational modules, geared to different grade levels, from K-12. The modules cover a variety of topics, from measuring biodiversity to modeling predator-prey relationships in soil and more. For more information about NIMBioS Education & Outreach offerings, contact Associate Director of Education & Outreach Suzanne Lenhart (slenhart@tennessee.edu) or Education & Outreach Coordinator Greg Wiggins (wiggybug@nimbios.org). This entry was posted in Education/Outreach, Elementary School, high school, Middle School, STEM, Teachers, tools and tagged Education, Education/Outreach, STEM, teachers. Bookmark the permalink.